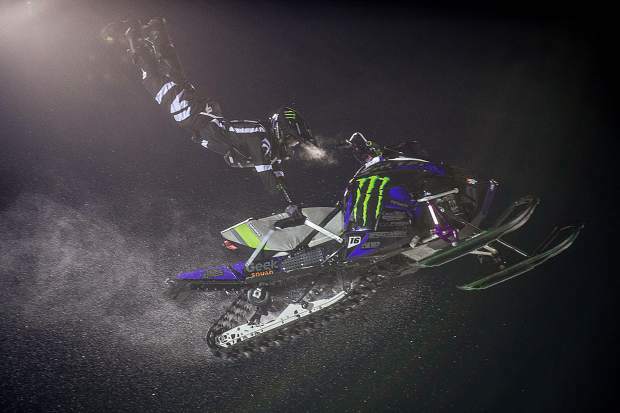 Canadian Brett Turcotte competing in the snowmobile freestyle final at X Games on Friday. Turcotte finished in first place with a high score of 92. Brett Turcotte, who won his first X Games gold by beating Levi LaVallee in speed and style Thursday, repeated the feat Friday night against LaVallee, this time in the freestyle event. Feeding off Thursday night’s energy, Turcotte’s big trick of the night was the first of his second run when he went side-saddle on his sled before the jump, then in midair spun himself 360 degrees before getting back on the seat and landing, but without holding onto the handlebars. It happen in a manner of less than 4 seconds in the air and earned him a 92 from the judges. Veteran freestyler Joe Parsons came into Aspen with the chance to unseat Shaun White as the most decorated Winter X Games athlete, but Parsons again had mechanical issues and failed to podium. Parsons has 17 medals, one behind White, who competes Sunday in the superpipe. Parsons, who had to pull out of Thursday’s speed and style because of mechanical issues, won freestyle the past two years. Friday was his 10th start in the event and he has claimed eight medals (three golds and five silvers). But dealing with sled issues again, he finished seventh. Sweden’s Daniel Bodin, who has four X Games golds including best trick last year, had to drop out after Friday’s first run when he crashed and broke ribs. Without the best trick event this year at Aspen, the snowmobilers are finished for the year at Buttermilk. Through the weekend are snow bike events with a crossrace Saturday and the debut of the best trick Sunday night. Turcotte and X Games veteran Heath Frisby, who has 11 medals dating back to his first bronze in 2007 freestyle, are on the start list for Sunday’s snow bike best trick. Frisby finished eighth Friday in his 10th freestyle appearance. The eight-rider field in the women’s superpipe Saturday night has some serious Olympic and X Games chops. The invite-only lineup consists of six Americans, including all four women headed to Pyeongchang, and two Chinese snowboarders with Olympic history. Team USA snowboarders for next month are Steamboat Springs’ Arielle Gold, three-time Olympic medalist Kelly Clark and Californians Chloe Kim (Aspen winner in 2015 and ’16) and latest teen sensation Maddie Mastro (who was third at the Snowmass Grand Prix). Hannah Teter, who won Olympic gold at the 2006 Games in Turin and silver in 2010 at Vancouver, is in Saturday’s field along with Elena Hight, who also competed in 2006 and 2010 Olympics. Hight has five X Games Aspen medals dating back to 2004 including last year’s win in the superpipe. China’s Cai Xuetong, who was second here last year and third in 2016, finished sixth at the 2014 Sochi Games and 23rd at Vancouver when she was 16 years old. China’s Jiayu Liu, who is riding for the third time in Aspen, was fourth at the Vancouver Games. Saturday is the biggest day at Buttermilk with six finals events and two concerts in the mix. The slopestyle course will host the women’s skiing at 11 a.m. and then men’s snowboarding at 1 p.m. In between, at noon, is the last women’s snowboard big air competition before its Olympic debut in South Korea. Snow bikecross is back for the second time at 1 p.m. The evening competitions include the men’s ski big air (which is not an Olympic event) at 7 p.m. then the women’s snowboard superpipe at 7:45 p.m.
Saturday’s concert schedule is Method Man & Redman concert at 5:30 p.m. and LCD Soundsystem at 9:30.